The Penthouse at The Flying Penguin is a two bedroom self catering apartment. The Penthouse at The Flying Penguin is a two bedroom self catering apartment sleeping 4 guests. It has panoramic ocean views across all of False Bay from Hangklip to Clovelly. The master bedroom is massive with extensive sea views and a king size bed. The second bedroom has two single beds and offers mountain views. The living area comprises a huge open plan lounge, dining room and kitchen, again with the fantastic views for which we are renowned. The bathroom has a Victorian slipper bath and a shower. The bathroom can be accessed from both bedrooms. The penthouse is best suited to families or to friends travelling together. We offer guests free wifi, uncapped. Note that the wifi is not fantastic - it is possible to stream movies but sometimes they will buffer and it can be annoying. We are limited by the incumbent service provider and there is not much we can do about this. The penthouse has satellite TV, barbecue facilities on the deck and a full kitchen. english, A little bit of French and German. 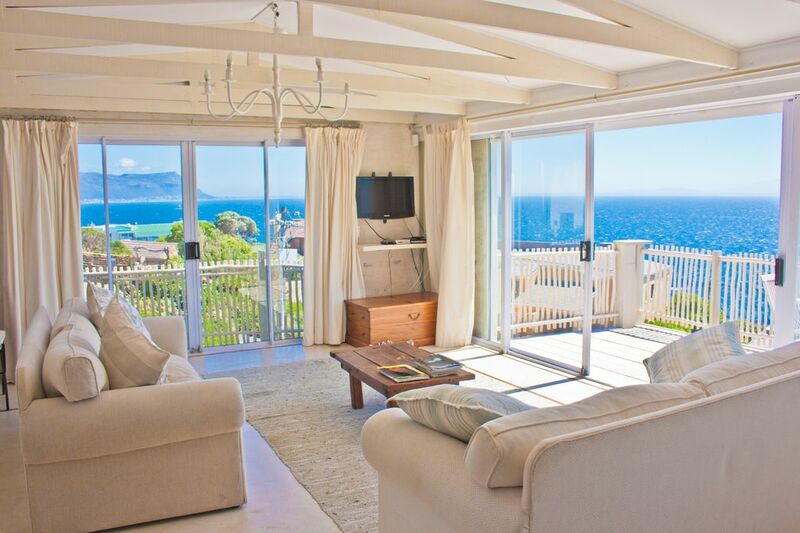 We have uninterrupted ocean views across all of False Bay. Sunrises are world class. At the right time of the year, you can expect to see whales breaching in the bay. Full fridge/freezer, electric oven, gas hob, microwave, dishwasher. Large 10 m x 2.5 m deck with sea views. We are within 3 minutes drive to Boulders Beach and the Penguin Colony.